Nov. 25, 2000 - Purchased at a flea market in Amherst, Nova Scotia, for Cdn$20.00. I haven't even cleaned off the dust yet, but I know it will need some work on the electronics - slight hum, can't hear any stations, and the dial cord needs to be tightened up. 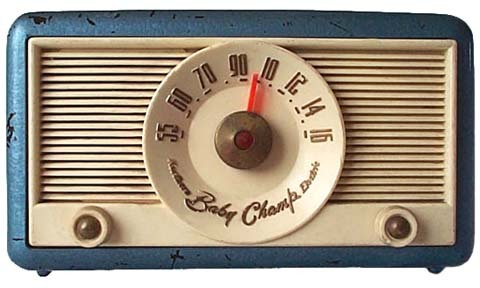 I recognised it from the Baby Champ at Phil's Page of Vintage Radios, which was the first Baby Champ that I had seen that wasn't a Rainbow. Check out this 1951 advertisement (82 kB) that I bought in April, 2001.